House training a puppy can be difficult. Some pet owners find it overwhelming to find the dog training method that works for them. The fact that there is a great deal of disagreement within the professional dog training community regarding ethical and effective methods also doesn’t help. If you are wondering how to train your dog positively, we as well-known trainers providing dog training in Toronto are here to guide you. The theory behind this dog training method is that puppies will repeat behaviours that earn them a reward. Naturally, you will have to reward them with a treat or a toy or praise them for the desired behaviour and not acknowledge the bad actions. This will help them to differentiate between good and bad habits. This technique does not involve any harsh forms of punishment. If you feel the need to reprimand your puppy, you may take away their reward. Since positive reinforcement is a continuous process, it helps if your family members also take part in it and are aware of what is good and bad behaviour. 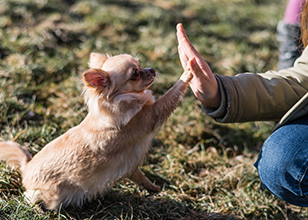 This is similar to the positive reinforcement training method and is often grouped with it. It involves making a quick, distinct noise using a clicker or merely whistling to signal to your pup when they behave properly. It also helps to reward them for good behaviour. When used with other training methods, clicker training helps to make sure your pup is obedient and well-trained. At Alpha Paws, we use the most effective dog training programs to help you develop and maintain a beautiful bond with your puppy. We can come up with the best training methods to house train a puppy and help you understand their behaviour. 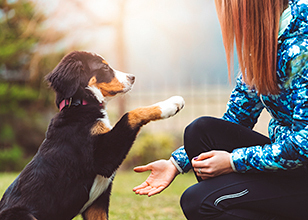 If you wish to train your pup using positive dog training techniques, reach out to our experts by calling 1-877-868-5248 (PAWS) or fill out our online form if you have any questions.